Tomas Verner (21) of the Czech Republic performs to music by Django Reinhardt for his Short Program. In the men’s error-ridden competition, Tomas Verner from the Czech Republic was one of the few to avoid major blunders, and is currently first with a new personal best of 79.03 (41.46/37.57) points. Like last year, Verner was the last skate. Though Verner didn’t see Lambiel’s score, he saw the skater’s face. Performing to Melodie en Crepuscule and Gypsy Swing by Django Reinhardt, Verner opened his engaging program with an impressive triple flip-triple toeloop combination, but the landing of his triple Axel was tight. The 21-year-old partially blamed the ice conditions for the less than flawless landing. 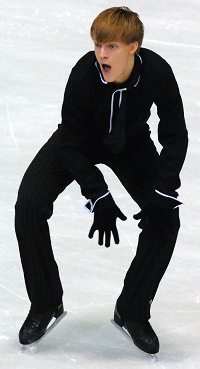 Though Verner later stumbled on a twizzle during his circular footwork, the defending silver medalist nonetheless earned both the highest technical and component scores of the evening. The 2007 NHK Trophy silver medalist received a level 3 for circular footwork and flying change of foot combination spin, and a level 4 for his straightline footwork and change of foot sit spin. France’s Brian Joubert is currently second with 75.25 (39.43/36.82) points, despite making a mistake in his quad-triple combination jump (he put a three turn in between jumps) and falling on a triple Axel. The current World Champion later admitted to being very nervous. Despite the errors on the jumps, Joubert otherwise gained a level 3 on most of his non-jumping elements (except for a level 1straightline footwork sequence). The Frenchman was obviously winded towards the end of his performance to All For You. The defending champion attributed his mistakes to the loss of training time due to a viral infection earlier this fall. The infection also forced him to withdraw from Trophee Eric Bompard and consequently, miss the Grand Prix Final. Stephane Lambiel of Switzerland is third with 71.78 (35.79/36.99) points after stumbling out of his opening triple Axel and turning his planned quad-triple combination into a triple-double. The 2007-08 Grand Prix Final champion nonetheless performed his program to Carne Cruda with lots of expression, while gaining a level 4 on all his spins and a level 3 on both step sequences. His program also stood out among the rest due to the intricate choreography which linked the required elements together. Notwithstanding, Lambiel remains rather optimistic about his chances of winning the competition. Belgium’s Kevin Van der Perren is currently 4th with 66.33 (34.97/31.36) points – just a notch below the top three competitors. The defending bronze medalist turned his planned quad-triple combination into quad-double and later doubled a planned triple Lutz out of footwork. His program to Xotica by Rene Dupere seemed empty compared to that of his rivals, but the Grand Prix finalist managed to gain a level 4 on all his spins. He also received a level 2 and 3 on his footwork, which fit the strong beat of the music well. Van der Perren also claimed he is no longer bothered by his hip injury. Kristopher Berntsson of Sweden finished fifth despite his low ISU World Standings, which placed him in the fourth of six groups. The 2007 Nordics champion gave a fairly solid performance which featured a triple Lutz-triple toe combination (tight landings on both jumps), a triple Axel, and very good level 4 spins and level 3 footwork. However, he put his hand down on the landing of a triple flip and the judges did not appear to enjoy his entertaining performance as much as the audience. He received a score of 65.62 (38.37/27.25) points, with the third highest technical score of the night. Russia’s Sergei Voronov appeared to be nervous and reserved throughout his program to Rachmaninov’s Piano Concerto, which put him in sixth place with 64.26 (31.12/33.14) points. The student of Alexei Urmanov competed at Worlds last year, but this event marks his debut at the continental championship. The Russian champion opened his program with a quad-double combination, but later had to fight for the landing of a triple Axel (later called as underrotated), while noticeably turning out of the jump in the process. He also had trouble maintaining balance on the landing of his triple loop, and had a minor stumble during the straightline step sequence (level 1). The 20-year-old was not happy with the call on his triple Axel. The highest ranked skater not to receive any negative Grades of Execution (GOE) on any elements, was Gregor Urbas from Slovenia. The 2007 Golden Spin champion, who is currently 7th with 63.43 (36.18/27.25) points, produced a triple Lutz-triple toeloop combination, a triple Axel, and a triple loop out of steps. His non-jumping elements, however, were relatively weak as his step sequences received only levels 1 and 2, and one of his spins was graded a level 2.